Everywhere you look these days there is a new smart home device that boasts it will help you make your life easier and give you peace of mind. 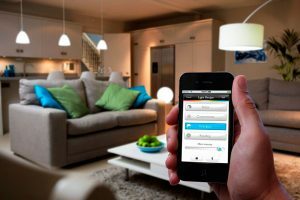 Whether it´s controlling your lights at the touch of a button, using voice control to play your favourite radio station when you walk in the door or checking your home cameras from your phone while you´re on holiday. The possibilities are endless. It doesn´t matter if you choose an off-the-shelf solution or a more in depth control system. We remove all the hassle and confusion and help you create a custom smart home installation that works for you and your lifestyle. TV entertainment and home technology installations are what we do best. This is because we have an expert team with over 25 years custom installation experience who work hard to find simple solutions to every day problems. Because we´re a small business we take care to listen to our customers, offer honest advice and make sure that we understand your needs and how technology can make your life easier. As well as satellite, TV and multi-room audio we can also provide specialised home control and create the ultimate luxurious and comfortable home cinema experience. We want to ensure that the end result is exactly as you imagined and for this reason we welcome the opportunity to work alongside your builders, architects and interior designers. We have solid customer service which together with our professional and experienced engineers provide support with enough technical expertise to guide you through the more common problems that can occur with your home entertainment installation.